The WPS is also important from a national security standpoint. In fact, during World War II, Japanese invaders used an island in the Spratlys to stage attacks against Philippine positions. The fear of the Kalayaan Island Group falling into the hands of another state thus has echoes of the past. Indeed, as early as 1933, long before the country attained self-rule from the U.S., Filipino leaders had already expressed the importance of incorporating the features of the WPS as an integral and indispensable part of their nation. The WPS also lies along major Philippine trading channels, and control of these waters by an unfriendly state could cripple the country’s improving economy. To this concern add the close proximity of many foreign-occupied features. Hence, China’s 1995 occupation of Panganiban (Mischief) Reef, its alleged effective occupation of Bajo de Masinloc since last year and recent moves in Ayungin (Second Thomas) Shoal have all been met with concern and even outrage in the Philippines. These developments lend credence to the idea of a creeping westward push by China towards poorly defended Philippine posts. This, in turn, prompts calls for the modernization of the Philippine Navy and the Philippine Air Force to deter further intrusions and occupation of new features and to guard against unfriendly moves by other claimants. The increasing assertiveness of other claimants also pushes the Philippines closer to its mutual defense treaty ally, the U.S., whose forces have been allowed a rotational presence in the country since 1999, eight years after the termination of the U.S. bases agreement. All of this demonstrates the significance of the WPS for the Philippines. Allegations that Manila is making a mountain out of a molehill should be reconsidered in light of these legitimate interests. 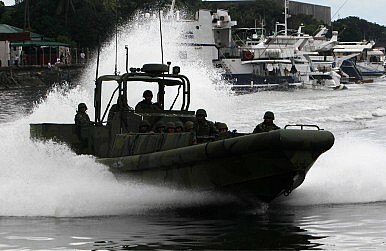 Emphasis on adherence to diplomacy and international law and a commitment to maintaining good relations with neighbors have long prevented the Philippines from fortifying and enhancing military facilities in its administered features, but further erosion of its defensive position may encourage a rethink. Moreover, because of the proximity access and potential transformative impact on Philippine economic development of WPS resources, any cooperative undertaking (namely, joint development) with other claimants may need to entail significant concessions to assuage Philippine fears that it is being disadvantaged. The Philippines had been seeking to align its position in the WPS with international law. In 2009, the country passed its baselines law, wherein the Kalayaan Island Group and Bajo de Masinloc were placed under a “regime of islands” consistent with UNCLOS, signaling that Manila has no interest in drawing EEZs and ECSs for its WPS features, which would excessively expand the country’s maritime entitlements and cause it to overlap with the maritime claims of other SCS disputants. The Philippines is also advocating a rules-based approach that calls for the delineation of areas under dispute from those that are undisputed, to facilitate talks on functional cooperation or joint development in disputed areas. This position had been communicated at regional meetings and summits on the SCS issue. The recent filing of a legal challenge against China’s claims in the WPS can also be understood as resorting to international law to encourage a rival claimant to clarify the extent, nature and bases of its claims. Lucio Blanco Pitlo III is an MA Asian Studies student from the University of the Philippines Asian Center specializing in maritime security issues and Philippine foreign policy. The views expressed here are the author’s own.